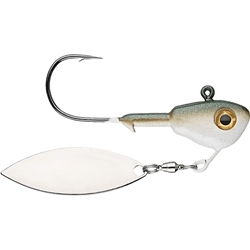 A great bait to add to your arsenal, the Buckeye Su-Spin Blade is an excellent choice for cold water situations and those times when fishing gets tough. Like a traditional underspin, it features a single willow leaf blade that comes to life with the slightest movement, reflecting light and attracting fish from greater distances. Out fish the competition with the Buckeye Su-Spin. You can use it with all of your favorite soft plastics or rig it with a skirt for a unique look.